Universal Tree Pruner made with drop forged steel double cutting action blades. Model 10-019 features two pulley rope string, that triple the power for cutting limbs up to 1-1/2 inch diameter. 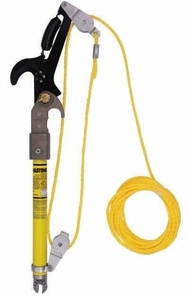 The tree trimmer is mounted on 12 inch fiberglass shaft with universal adapter and 25 foot polypropylene rope.